Make a bight and fold it into two loops. Pass the loop in the standing end through the other loop and then tuck the tail through it. Tighten the Half Knot first. Then pull the tail tight and finally the standing end. The underside of the knot shows three separate lobes. Uses: The Ashley Stopper Knot is the name now commonly given to a knot described by Ashley as the Oysterman’s Stopper (ABOK # 526, p 86). 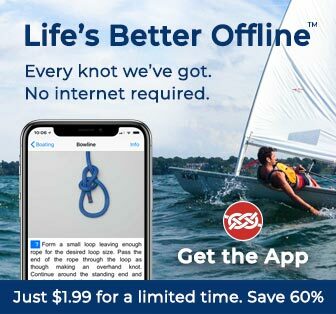 It is an excellent bulky stopper knot. Ashley’s description is that the knot “…has three rim parts, and these are quite symmetrical when viewed from the underside”. This 3-lobed structure can be seen in the final animation frame. Similar Knots: The Ashley Stopper Knot should be compared to other knots commonly used as stoppers including the Double Overhand, and the Figure 8. In boating, the Figure 8 is particularly common. However, it has a tendency to come undone far too readily and the Stevedore deserves to be better known. In climbing, the Double Overhand is more widely used – for good reason – it is far less likely to just shake loose. It also forms the basis for tying the Double Fisherman’s and the Poacher’s or Double Overhand Noose. For slippery ropes the EStar Stopper is the best. Tying it: The Ashley Stopper Knot is satisfyingly easy to tie with a diagram in front of you. It is also surprisingly easy to get it wrong – as I found out the hard way by getting the animation wrong initially. It is a pleasure to acknowledge Dan Lehman and Michael Schuh for making me photograph this knot correctly – thank you both! Tightening the Knot: Ashley emphasizes that to make a secure stopper, the Half Knot MUST be pulled snug first (shown tightening in frames 6 and 7 of the animation) . Then the tail should be pulled, and finally the standing end. Advantages: As a bulky, secure, stopper the Ashley Stopper Knot deserves to be more widely known. It is far less prone to shake loose than the figure 8 knot and is the bulkiest of the simple stoppers.